Let’s forget for a moment what it means for a 48-year-old man to not only purchase a book titled Kong Unbound: The Cultural Impact, Pop Mythos, and Scientific Plausibility of a Cinematic Legend, but to then cavil about its quality. What did I expect, a tome to the cinematic simian on a par with Agee on Film? 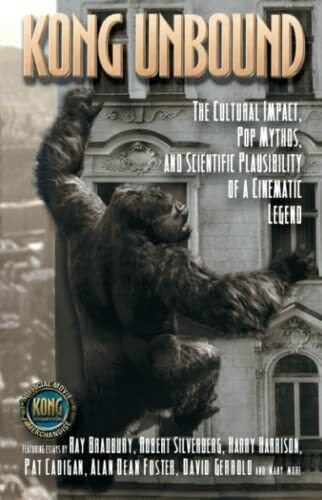 With that little mea culpa out of the way, this volume features a dozen and a half essays by some pretty notable figures, most of them in the field of speculative fiction, all of them pontificating on the modern myth that is King Kong. A fine idea — if only a lot more care had been invested in the execution of the project. Witness the book itself: printed on cheap paper, rife with typos and formatting errors. Didn’t anybody proof this thing before it went to press? Regarding the content, while a handful of the essays are interesting and entertaining, too many of them traverse the same ground ad nauseam. Material incessantly overlaps and we’re presented with the movie’s plot way too many times (would anybody who didn’t already know the film by heart be reading this book in the first place?). Karen Haber, who is credited as the editor, should have shaped the material, organized it in such a way that there wasn’t so much repetition, and presented it in such a fashion that each piece complemented the next. Some of the information provided is just outright incorrect, such as Harry Harrison’s comments on the special effects in Creation, the aborted RKO film that would eventually become King Kong: “They were created by Willis H. O’Brien, assisted by a youthful Ray Harryhausen, who virtually invented stop-motion special effects for film.” The problem being that Harryhausen, who indeed would go on to work with O’Brien on Mighty Joe Young in 1949, was only 12 years old at the time of Creation. Didn’t anybody fact check this book before it went to press? While some of the writers, like David Gerrold (who here invokes the fun of his books The Trouble With Tribbles and The World of Star Trek), approach the subject with tongue-in-cheek reverence, too many of the essayists seem to have seized this book as an opportunity to confess for their sin of ever having enjoyed King Kong, what with all its scientific and technical inaccuracies and improbabilities, in the first place. In those instances, the book reads like an interminable treatise on why there isn’t a Santa Claus. Robert Silverberg’s essay, “The Magic and Mystery of Kong,” shines, speaking to the child in all of us. He successfully draws from art and literature to examine Kong‘s popularity and longevity. The “conversation” about King Kong that closes the book, between William Joyce, Michael Chabon, and Maurice Sendak, is fairly pointless. We’re not apprised of its context (were they on a conference call, onstage, sitting in a bar? ), and what’s been provided appears to be nothing more than a transcription, with Chabon mostly contributing “Uh-hum” and “Right.” Once again, the editor abrogated her responsibility in helping organize and render this material more meaningful. Speaking of Ms. Haber (who is married to Robert Silverberg), she goes on and on in her introduction about the co-opting of King Kong, yet apparently isn’t troubled by the “Kong Official Movie Merchandise” labels plastered on the front and back of her own book. Perhaps part of the problem is that Ms. Haber only commissioned science fiction and science writers to write about the classic 1933 film. While indeed the prospect of modern-day dinosaurs and a giant ape are indeed the stuff of science fiction, Kong, what with its dark dream imagery, remains as much a horror story. I can’t help but wonder what the likes of Stephen King or Clive Barker could have contributed in terms of how the film insinuates itself into our psyche and wraps itself around our deepest fears. Money would be better spent on the The King Kong Collection, a two-DVD set that includes the newly restored and digitally mastered 1933 original film, commentary tracks, and numerous intelligent and informative documentaries about the making of the film; included, too, are the films Son of Kong and Mighty Joe Young. While Son of Kong unfortunately stands as RKO’s quick-buck effort to capitalize on King Kong‘s success, and Mighty Joe Young is arguably nothing more than New Age Kong redux, the original film, the one that started it all, not only speaks for itself — it roars.